Sossusvlei dune 45 Driving through Namibia on gravel roads for days we started to wonder ‘where do they shoot all the amazing BBC Namib desert documentaries?’ We drove through thousands of kilometers of beautiful nothing. Amazing flat landscapes but not the amazing red dunes you see in photographs. Tired of driving we eventually found the spectacular answer, Sesriem, Sossusvlei. For more details, info and itineraries check our article Namibia travel itinerary, 30-day self drive trip through Namibia. 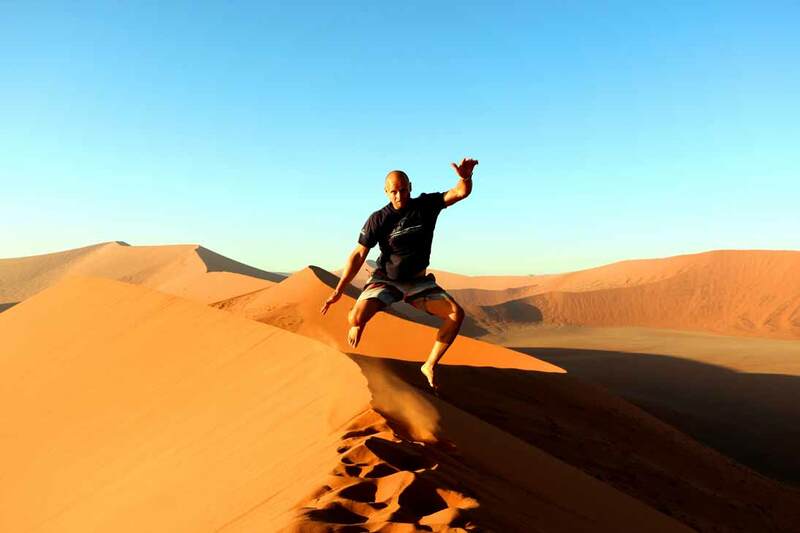 The highlights of Sossusvlei are Dune 45, Deadvlei and Sesriem canyon. True Stingy Nomads style our Sesriem adventure started of as a bit of a disaster and turned into an awesome experience. There are two options for camping at Sesriem, a public and a private campsite. Tired and happy that we finally arrived, our mood changed instantly when we heard the price. R200 ($15) per person for the government and R180 ($13.50) in the private campsite! Not being willing to pay R400 for a spot to pitch our own tent, we drove off without many options. We eventually found a nice spot next to the road, made some coffee and sandwiches and slept in the car. The campsite is open from sunrise to sunset. Seeing the sunrise from Dune45 is a big thing. 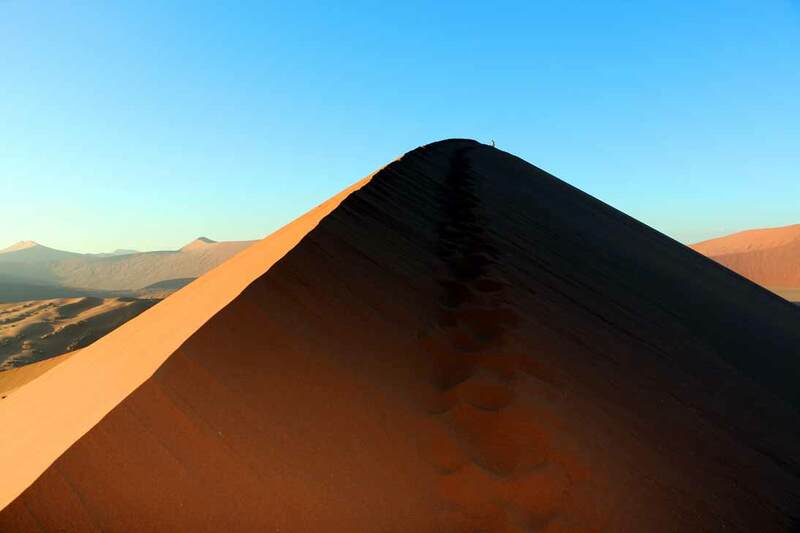 This famous dune is located 45km from the entrance, making seeing sunrise from here impossible if you enter at sunrise. You are however allowed to enter the park one hour earlier if you stay at the government campsite. Sneaky, sneaky, those government employees are smarter than we thought..
Sleeping in the car we were packed and ready to go, in front of the line when the gate opened. Luckily this was a while before sunrise. 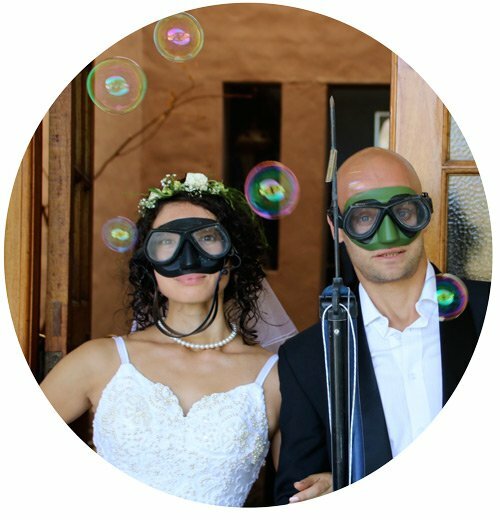 I think the picture says everything, truly spectacular. We were climbing this awesome dune as the sun was rising. 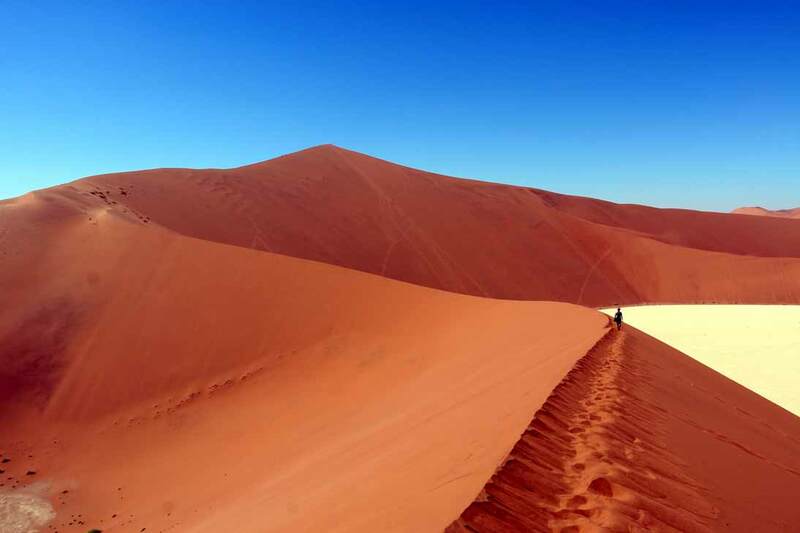 Dune 45 is the most famous dune in the Namib. Its fascinating shape and accessibility makes it the most photographed dune in the world. It is 80 meters high, not the highest dune in the park. 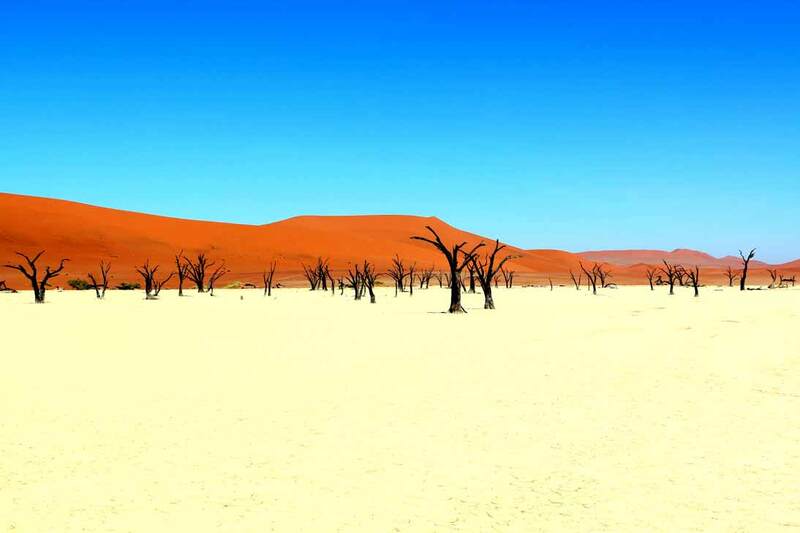 Deadvlei (Afrikaans for ‘dead marsh’) is a large clay pan characterized by dark, dead camel thorn trees contrasted against the white pan floor, surrounded by the huge rusty red dunes. The pan was formed when the Tsauchab River flooded and sufficient water allowed camel thorn trees to grow. The climate changed, sand dunes formed blocking the river from reaching the area. The Deadvlei is a great place for taking photos. The contrast between the black trees, white pans, rusty-red dunes and deep blue sky make for incredible images. The last 4km to the Deadvlei is a 4×4 only road. It is thick sand and the guides did not think our smaller 4×4 would make it. When we heard the price for the shuttle (R150/$10) we decided to drive ourselves. We deflated our tyres and powered through! This is the highest dune in the park, about 350m high and an hour’s walk from the parking area. It is still lower than dune 7 outside Swakopmund. The canyon is located about 4.5km from the park entrance. The canyon is not very big, but is beautiful. Look for the sign inside the sesriem campsite. The Tsauchab River has shaped the Canyon over millions of years and it is one of the few places in the area that holds water all year round. It is about a kilometre (0.6 mile) long and up to 30 meters (100 feet) deep. 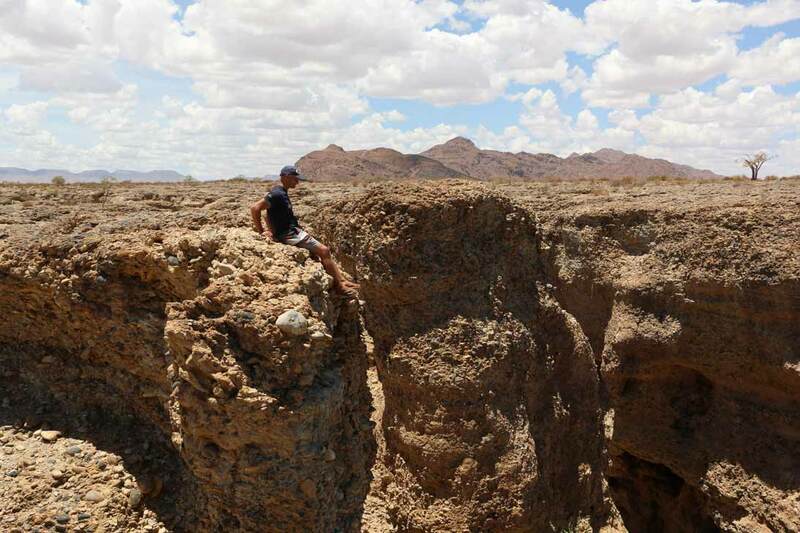 The name Sesriem (Afrikaans for six belts), were given by settlers who had to attach together six oryx hide belts in order to reach buckets down into the canyon to scoop up water. The Sesriem Canyon is very narrow, only two metres (6.5 feet) wide in some places, and has a portion that permanently contains water, which many animals use. The best time for taking photos is with sunrise or sunset when the shadows make the dunes spectacular. 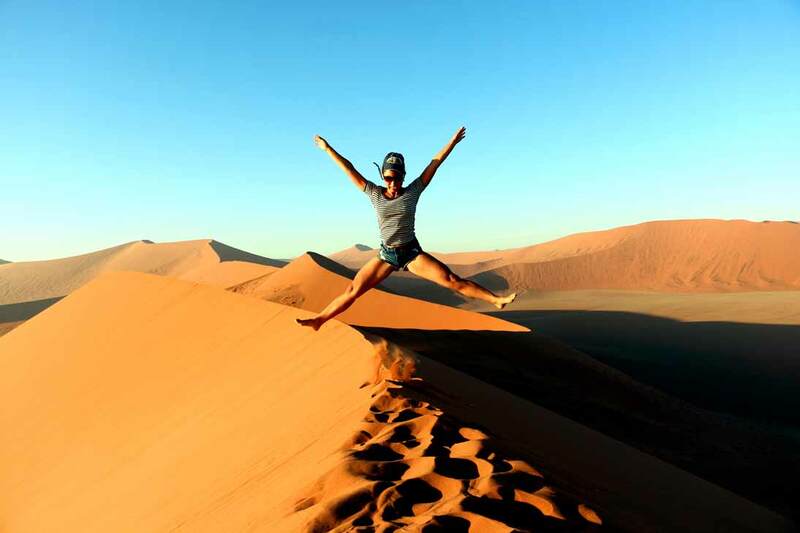 Don’t miss the amazing red dunes at sunrise! Experience sunrise and sunset without breaking up your tent early in the morning, only paying for one night and day in the park. Here is how: pay for one night’s camping and one day (24 hours) in the park. Enter the park early (about lunch time), pay entrance+camping, explore sesriem canyon, the dunes, see Dune 45 at sunset, next morning get up early see the sunrise from Dune 45. Go and break up your tent and leave the park in 24 hours. Take water, a hat, sunscreen and a camera. The trip should take about 5 hours, climbing Big Daddy takes about 1h30 min from parking.